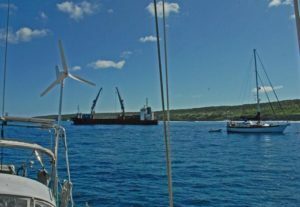 Niue has been a rolly anchorage the last few days, as has been the landing at the quay. The swell has been from the south and rolled through the anchorage and onto the wharf. Since there is no harbor here, there is no place to leave even dinghies in the water. Every time we go ashore we raise our dinghy onto the concrete wharf with the provided crane. The last few days, with 4-5 foot waves rolling past the crane and breaking 10 feet away our landings have become the stuff of Olympic legends. Yesterday we decided we’d had enough rolling and checked out, planning on leaving today for Tonga. 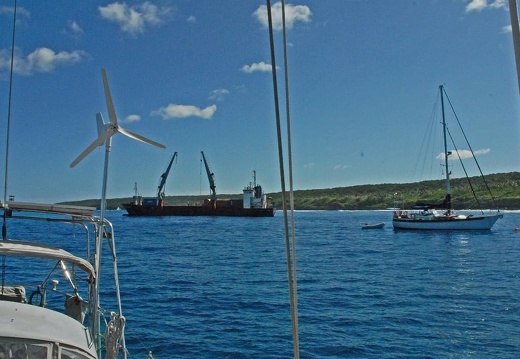 At breakfast this morning Niue Radio broadcast a Tsunami alert to all the yachts on anchor. We quickly raised and secured the dinghy, started the engine, and cast off our mooring. We followed Nine of Cups to deeper water, ourselves followed by three other boats. In case you didn’t know, Tsunamis are virtually unfelt by boats in deeper water, it’s only when approaching a shoreline that the wave achieves its potential in height and power. The bottom quickly dropped off to hundreds, and then thousands of feet. Safe once again. We are now hearing bits and pieces about the earthquake and subsequent tsunamis. With friends on sailboats in both Samoa and American Samoa we are anxiously waiting word on how everyone is doing, and how the local communities are fairing. Tsunamis can travel as fast as 600 miles per our, so American Samoa wouldn’t have had much, if any, warning. On Niue we had twenty minutes of warning, our warning was slow enough that we were actually still on our buoy twenty minutes after the earthquake hit. Whew! Today on Yohelah we’re happy the tsunami went the other way and praying all is well for our friends in Samoa….